Our professionals have put together a detailed home theater installation cost guide including useful tips you may want to know before making your purchase. When you get back home from a tough day at work or your plan for the Saturday night is to relax with your family or beloved ones on the couch, there is nothing better than watching a good movie. Or what about your favorite baseball and basketball team? It’s way better watching their wins on widescreen TVs with amazing sound systems that can give you goosebumps every time the crowd screams and make you feel like you are right there, watching live. The rapid technological development has dramatically transformed such entertainment activities with more and more advanced systems now available on the market. That is why more and more families are setting aside significant budgets for building the perfect home theater corner in their homes. This guide will provide you with some useful information on the different types of home theater systems that you can install, as well as some important tips and tricks that should be considered when deciding what kind of equipment will be the best fit for your household. You will get acquainted with the importance of the room design for the acoustics and the overall cinematic experience. Home theater systems are a mix between projector screen/TV, sound and other components that can entirely replicate the quality of professional cinemas through a combination of great picture and amazing sound. Watching your favorite movie in the comfort of your home while still being able to enjoy the same experience like the one in the cinema, will guarantee you amazing moments and some unforgettable memories. But is it possible to sit at home and enjoy a film to the same extent as when you are in the cinema? The answer is – yes, you can! That is all possible by the different screens/TVs, sound systems and other accessories that are now available on the market. Setting a wide-screen projector screen or a TV and a good surround system will dramatically transform the way you watch movies at home. Whether your neighbors will like that – probably won’t be the happiest people the world. The installation of such entertainment center at home does not require any specific skills or competences. Unlike many others, the home theater installation project can be handled even by a DIY enthusiast. Yet, there are some cases where depending on the equipment and the installation specifications, you may experience the need to hire a professional. For example – a very important step when you are planning the installation process is determining the best location to place the speakers. If you are not familiar with the basic rules for perfect acoustics, it will be better to consult a professional, so that your further entertainment will not be harmed. Another important issue that may complicate the installation process is the wiring. Bear in mind that if you hire a professional electrician, the chance for your wires to become “invisible” after installation is way higher than if you handle it yourself. The home theater corner in your house is the comfortable relaxation zone that you will love to spend some hours in. That said, you don’t want some messy cables and wires to harm the aesthetics of your favorite entertainment area. Hiring a professional to handle the installation process of your home theater system costs approximately $80 per hour for projects of a medium complexity. If the installation requires less work or is quite simple, the price can go as low as $60 per hour. When it comes to the hours needed for the task to be completed, an important thing to clarify is that it is pretty much dependable on the cable and wiring specifications. For example, if the project requires the cables to be built in the walls, that may further complicate the installation process and may take up to 5 – 6 hours of work. Otherwise, you should not expect the work to last more than 2 hours. Bear in mind that if you invest significant sum into professional home theater equipment, your best choice will be to hire a professional to handle the installation process. Most of the equipment producers provide exploitation guarantee for their products that may not be approved if the montage wasn’t handled by a certified professional. When buying all the different gadgets for your system, you may ask the representative whether they offer authorized installation support. Most of the producers do that as they also provide from 1 to 10-years labor warranty. If you are handling the process all on your own, without hiring a professional, bear in mind that before starting the installation of your home theater system, you should first consider the types of cables that you will need and their exact placement. Some of the cables like the patch ones, which connect different types of equipment can be handled on a later stage, but those types which are intended to be built in the walls (for displays, sound speakers and etc. ), should be handled at the beginning of the installation process. That way, you can ensure the comfortable and smooth working process, because the remodeling of a wall at a later stage, when the installation is about to be completed, can be a very hard, expensive and unnecessary task. Another important thing that you should consider when planning your project is the way cables will come out of the wall. There are, basically, two main options – an open hole in the wall behind the device that should be connected and a pass-through wall plate jack. It is the latter that is more popular and, although it will cost you a little bit more, will ensure a better look and exploitation quality. Bear in mind that whatever option you choose, you should aim for such cables, wires or plate jacks, that match the color of your wall. Most of the equipment producers offer such options and you should consider that before making a purchase. A color-matching components are much more pleasing to the eye as they will simply “vanish” into the wall. So, after all that is figured out, it is time for you to proceed with the main step in the process – the room design. Remember that no matter how much money you spend on fancy gadgets and high-end equipment, if it is put in the wrong places, the whole effect of your home cinema may be significantly harmed. The viewing angle, the acoustics, the lights – everything should be handled according to specific requirements. Otherwise, you risk your whole cinematic experience. For example – the location of your speakers and the acoustics in the room can make a low-class equipment sound great and a high-end equipment sound perfect. So no matter whether you spend $500 or $10 000 on a sound system, the overall effect is pretty much dependable on the room design and the location of the different components. After all the details for the easy and effective installation process are clarified, there comes the most interesting part – choosing the right equipment for your home theater system. The good thing with technology is that whenever a new model of certain product is released, the price of the old one drops significantly. And new models of different products are released every one or two years which provides the customer with the chance to have a very good and technologically enhanced equipment on a pretty affordable price. That said, you should bear in mind that home theater systems are not intended only for those who can afford luxury homes. Home theater systems are becoming more and more affordable with each and every year and almost anyone can bring the cinematic experience in the comfort of his home. So, what is important to know when it comes to estimating the appropriate cost of a home theater system is that a good initial planning will save you a lot of money. The line between the price and the value added is very thick and you should research the matter thoroughly, so that you can make the right choice. The cost of a home theater system can vary widely due to the various equipment solutions that are available on the market, all the possible combinations of components and their main characteristics. Before starting to plan the exact amount that you should set aside for such type of project, you should shape your vision about the final result that you would like to achieve. Bear in mind that a home theater system may cost you anywhere from $800 (if you plan to use some of your existing equipment – the TV for example, and will invest only in sound system and other accessories) to more than $80 000 for premium, high-end solutions that will bring all the cinematics effects in your house. So, the most important is to focus on planning ahead and figuring out your desired budget according to the quality of the TV, the BluRay player, the sound system, the gaming console (if you plan to add such component too) and etc. The final price is impacted also by different factors such as the complexity of the installation and the aesthetics of the home theater corner. For example – the more complex the chosen system is, the more wires and cables will be used. So, the best thing to be done in such cases is to effectively integrate them in the walls or hide them in cable sockets. The first and one of the most important components of the home theater system is the screen. Bear in mind that such investment is one for the long-term and you will probably use it for decades, so you need to reach for a good quality product. With this type of equipment, depending on your budget, your project’s goals and your personal preferences, you have two available options – to choose a projector screen or to stick to a traditional TV. If you are completely determined to bring the cinema into your house, you will prefer to buy a projector screen. Typically, a good quality 120” 16:9 screen will start from approximately $1500. The popular choice for cinematic experts will cost $3000 on average. Whatever kind of projector screen you intend to choose, bear in mind that it should match the capabilities of the projector (and the other way around). If you would like to stick to a more affordable choice, then a TV screen will do the job for you. Although the feeling will not match the one with a projector screen, there are amazing wide-screen TVs that, combined with a decent amount of popcorns, can dramatically transform your Saturday night. After the visual effects comes the sound – that one aspect of your home theater system, that can make your neighbors knock on your door, if your room is not soundproofed. This is the second most important part of the equipment, that you should be willing to spend on more. You will never hear someone saying he has spent too much on speakers. So, depending on the room type and the effect that you would like to accomplish, the speaker configuration can consist anywhere from five up to nine speakers and a proper set of subwoofers too. As with the screen, there are a wide range of available choices for a sound system that can fit any budget. 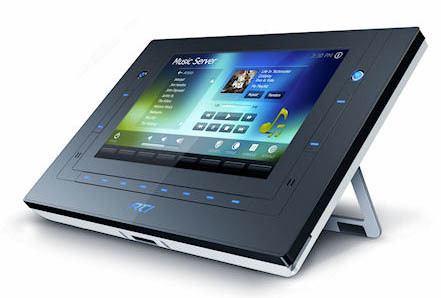 For example – you can choose from a traditional 5.1 surround system, to the newly designed object-oriented speakers that will adjust themselves automatically, depending on different factors such as – where is the nearest person sitting, the movie type, the current frame that takes place on screen, the room specifications and etc. The first important part of the sound system is the front and the center channel speakers. Experts recommend spending anywhere near $300 – $500 per speaker. This may sound frightening for anyone with a tight budget, but bear in mind that you can always cut corners with the price of the rear and the surround speakers. The acoustic experience is most of the time, brought to you by the front and the center channel speakers as they are way more important than all the others. That is due to the fact that approximately 60% – 80% of the speech in a film will come from the center channel speaker. So, for the front and center channel speakers you can expect to set aside from $900 to $1500 for a very good quality that will significantly enhance the cinematic experience in your home. Next comes the subwoofer. Decent-quality solutions start from $500 and go up to more than $5000. If you wonder what your choice should be, a good way to find out is to consider the film genre that you and your family prefer. If you are a big fan of special effects, you will consider focusing on a more expensive subwoofer. Another option for you is to buy two subwoofers instead of one. That way, you will make sure that the bass will be spread even across the room. When it comes to the side speakers, also known as “effects channels”, it is very important for you to once again reconsider your budget. This is the part of the equipment, that you can save money on as it is not from such importance for the whole cinematic experience. Good quality side speakers will cost you $400 and above. Next on the list is the home theater projector. If you decided to stick to a TV instead of projector screen, you may skip that point. Otherwise, everyone who has chosen to invest in bringing the cinema in his house, will have to read carefully. Projectors are dramatically improving and getting cheaper every year. For approximately $1300 – $1500, you can buy a decent quality projector that will satisfy the needs of your project. If you would like to spend anywhere below that range, better stick to a TV as you will get way better quality than with a low-class projector. The cheaper projectors are intended for business or educational purposes as they can perfectly visualize a presentation, but when it comes to cinematic effects, they are not the one to reach for. Of course, if our budget allows, you will be more than pleased to reach for some more expensive solutions (starting from $10 000 and going up to $50 000) with features such as 4K. Bear in mind that before choosing a projector, to consider the fact that they do not come with a lifetime warranty. You can expect your projector to serve you no more than 6 000 hours. That is all because of the lamps that are placed inside. After they give up, they must be replaced and it will be better for you to check the price of the lamp for your preferred projector model, before buying it. Another part of the whole equipment that you should set some money for, is the home theater receiver. Considered as the focal point in the whole system, the receiver is responsible for the sound and video processing. The amplifiers section inside the receiver is the one which ensures the sound dynamics and the highlighting of the special effects. That is why, if you want the high-quality speakers that you have bought, to do their job perfectly, you should consider spending enough money on a receiver. Although you can buy a receiver for as low as $200, it is advisable if you reach for a solution in the higher range – from $600 to $900. If you have some spare $3000, you can go further and buy a separate receiver and amplifier, which will be the top-notch choice for your home theater system. For as much as $5600, you will have a fully equipped home theater system with amazing visual and sound effects, as well as comfortable seats for your beloved ones. Of course, such project can be way cheaper if you aim at more budget solutions such as TV and a standard 5.1 sound system. If you plan to use some existing furniture, you can save additional money and in the end, for no more than $1500 – $2000, you will end up with a very good home theater zone that will absolutely satisfy your needs. An important think to bear in mind is that the difference between a mid and high-priced home theater system in terms of money may be very big, but in terms of quality and value added, it can be insignificant. So what you have to do is to research. Spending much is not a guarantee that you will buy the best solution out there. One last thing to be considered when planning your home theater room is the proper protection of your digital equipment. As you have already become familiar with all the stuff that you should place in your home in order to achieve an amazing viewing experience, bear in mind that such high-tech devices will consume a lot of electricity. The last thing you want is a damaged screen, projector or sound system from an electrical spike. That said, you should consider investing in a surge protection system that will prevent any potential issues with your equipment due to problems with the electricity grid. After all your tech components are connected to the surge protector, you will be confident that any excess electricity that can potentially harm your home theater system will be blocked. The best thing to do here is to consult a professional electrician who will further instruct you on the most suitable options that are out there on the market. Basically, you should remember that surge protectors have a certain rating based on the amount of electricity they can handle (measured in joules). For example, a surge protector with 1000 joules is a good starting point. So, if have decided to buy such protection for your equipment, bear in mind the most important features that one should possess: UL listed; In accordance to industry standards; Rapid response time; Easily handles lightning strikes; Can ensure both surge and spike protection. The home theater installation project is a complex process that consists from many important details that should be taken in mind when estimating the budget. Here are some useful tricks that will further help you judge what equipment to choose, how to handle the installation process and etc. On installation – if you plan to spend big on equipment do not consider to handle the installation process by yourself. Most of the high-end solutions are very sensitive and require appropriate installation and calibration, so that they can perform to the maximum. Also, executing the installation on your own, you risk to damage some specific and very fragile parts of the whole system, which will result in further costs. Bear in mind that most of the professional stores that sell high-quality home theater systems insist that it is installed exclusively by them, otherwise the guarantee may not be valid if a further problem occurs. On the screen size – customers spent hours wondering how big the screen for their home theater should be. The answer to this question for many people is simple – as bigger as possible. But if we track the development of the screen sizes during the years, we will find out that in the 90’s, a 26-inch screen was considered as a luxury. Then 32-inch became normal and nowadays, the average size of a TV screen is in the range of 40 – 47 inches. The rule of thumb when choosing your screen size is to measure the distance from where you plan to watch (in inches) and divide it by 3. That will give you the perfect screen size in inches. But that should be taken with a grain of salt as the screen size depends on other factors too, such as the aspect ratio, your eyesight, the size of the room, the viewing angle and etc. Bear in mind that the most important thing is the picture quality. Do not sacrifice it for a bigger screen size. That will significantly harm your cinematic experience. On the TV characteristics – of course there are many different characteristics that you should bear in mind when choosing the right TV for your home, but there is one important thing that is often being neglected – the PWM. The pulse Width Modulation is simply a method for controlling the brightness in TV and computer screens. It is achieved by rapid switching of the display’s backlight on and off. That process happens at a certain frequency that makes it so fast that a naked eye cannot detect it. PWM is used by the hardware producers because it is an easy-to-implement, cheap and effective way to control the range of possible luminance of the display. The problem with the PWM is that it may lead to migraines, headaches, eye fatigue, eyestrain and other similar issues. Although not a significantly dangerous problem, if possible, try to avoid buying such TVs. Do not hesitate to consult a professional in the TV store and ask for further clarification on such topics. The health of your eyes is way more important than the price you pay for the TV in your home theater system. On seating – many people feel that the couch and the sofas do not contribute for the cinematic experience as much as the separate seats that can be found in the cinema. If you are one of those, who prefer to set aside some budget on proper seating too, then bear in mind that the most important thing that you should do if you are not completely confident in the room design specifications, is to hire a professional, who will create a proper seating plan. You will agree that there is nothing worse than someone in front of you blocking your view. Many people who install multiple rows of seats for their home theaters and hadn’t handled the proper seat positions accordingly, think that they can fix that when placing the screen higher. Do not make that mistake – staring at a higher-placed screen for two hours will provide you with zero satisfaction and sensible neck pain. The price of the home theaters seating components varies widely and will cost you anywhere from $200 to $7000 per seat. The more affordable good options on the market start from $800 per seat. If you have some funds, then reach for the premium quality seats that start from $1800. Of course the price of the seat depends on its type, the materials that it is made from, the ergonomics design, massage functionalities and etc. On lightning – when planning your home theater, bear in mind that the lights are one of the key factors that determine your experience. You can’t sit and watch a movie in a fully lightened room, nor it is advisable for you to switch off all of the lights (although it is a better choice) as you can become distracted and not experience the cinematic effects to the max. That is why a proper lightning is an important thing to be considered from the most dedicated movie fans. The best choice are the ambient lights as they won’t reflect on the screen or cause uneven lightning across the room. LED lights are the must-have solution for this project as they do not generate any heat and will not influence the comfortable climate in the home theater. They will also allow you to control them remotely and to obtain a full harmony of picture, sound and light effects. Bear in mind that the lightning in the home theater zone should be multifunctional – both to ensure the amazing theater atmosphere and to fully illuminate the room for you to clean every corner easily. If you decide to spend some money on proper lightning, you should set aside some funds for hiring a professional to handle the installation process as well, so that you will be sure that any safety codes will be met. On maintenance – your home theater is very probably, the most expensive area in your home, so be wise enough to spend the needed time for its maintenance. The good part here is that once installed, your home theater system won’t need any significant maintenance except wiping the TV screen with specially designed cleaning products and removing the dust from the equipment. The latter is a very common problem that is often neglected. The dust has the nasty power to get in every single hole on the surface of the different equipment parts with their ventilation components the most problematic ones. Also, a very useful thing to remember is that if for some reason you experience visual or sound problems with your home theater, the first thing to check are the cables. There are numerous cases when people waste hours inspecting the problematic part, fearing that they should buy a new screen, sound system or projector, when the issue is just a small cable that takes few seconds to be replaced. On acoustics – if your room lacks the needed acoustic characteristics, it doesn’t matter if you have spent thousands for a high-end sound system, as in the end, its amazing sound may be significantly harmed. Nevertheless, you should not be so bothered, if you do not have any additional budget for enhancing the acoustics of your home theater area. The acoustics are important only for those who seek to achieve perfectionism. The important thing to consider if you are about to focus on your room’s acoustics are all the materials that are out there – furniture, walls, ceiling, floor and etc. Check whether there are many reflective surfaces, such as the wooden floor, chairs and table, windows or mirrors or your room is full of plush, drapes, carpets and other kind of absorbing materials. If you wonder what is the right answer to the good acoustics of a room – it is a mix of both. For example, the part of the room, where the front speakers are located, should have more absorbent materials to diminish the effect of the first acoustic reflections in order to reduce the chance of sound distortion. On the other hand – it is desirable if you place some furniture or elements with reflective surfaces in the rear part of the room. That way, you will add some additional dynamics to the sound as it will bounce in the whole room creating an amazing effect. 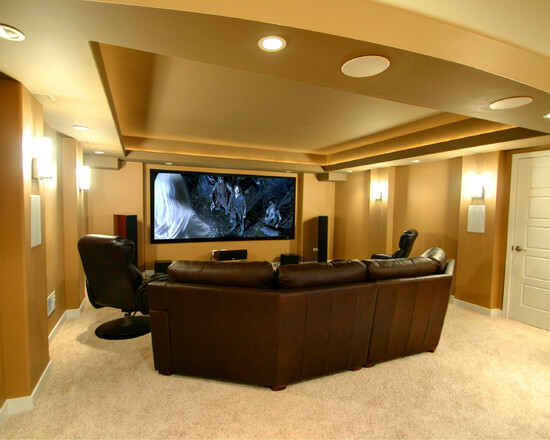 On walls finish – if you are a not so die-hard fan of the home theater idea and do not want to deal with your walls, you may skip that tip. But if you are from those who will dig deeper and investigate every single detail that can potentially improve the overall home theater experience, this advice is for you. Have you noticed that the walls in the local cinema are black? You most probably have. But do you know what is the reason for that? The dark colors (and more specifically – the black one) absorb the light from the screen, reducing that side shades and flashes that may harm your cinematic experience. For example, if you color your walls in red, ocher, white or any other bright color, it will reflect the light from the screen and bounce it back from where it came from. Thus, the screen colors may be harmed by the additional red, ocher, white or other nuances, depending on the color of the wall. That said, black, gray, brown or other dark colors are the best match for your walls. On the numerous remote controls – although a not so important issue, having multiple remote controls for every single piece of equipment in your home theater may be disturbing if you try to find the right one in the dark. That is why, many people consider buying a universal remote control (or two) that allow them to control all the different components comfortably. Some of these remote controls are available with a small backlight to help you locate it in the dark. Nevertheless, depending on the type of the system and its producer, you may be able to control everything directly from your smartphone which will significantly ease the process for you. Remember that there is no universal and perfect solution when it comes to choosing the right home theater system. Everything is strictly customizable according to the specifications of the project, your desire, goals and budget. 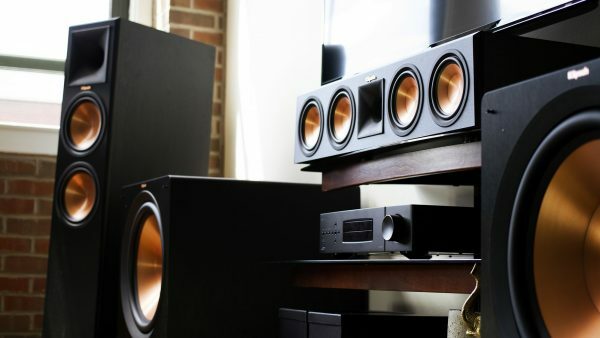 You can set up a decent home theater system for as less as $1000 with TV, sound system, cables and accessories or you can aim for the high-end solutions which will cost you more than $50 000. There is perfect solution that is right for every project and homeowner’s needs. On the market, you can find everything that you will need to set up the perfect entertainment zone in your home where you will spend numerous precious moments. A little initial research will help you judge what are the best solutions for your needs and then, what you have to do, is just sit, relax and enjoy your home theater.